Indeed, there are beauties all around us, so it really doesn’t matter where you stand, or live. I have not posted as much lately as I would have liked, and one of the reasons is that I have changed that place where I will stand and live. 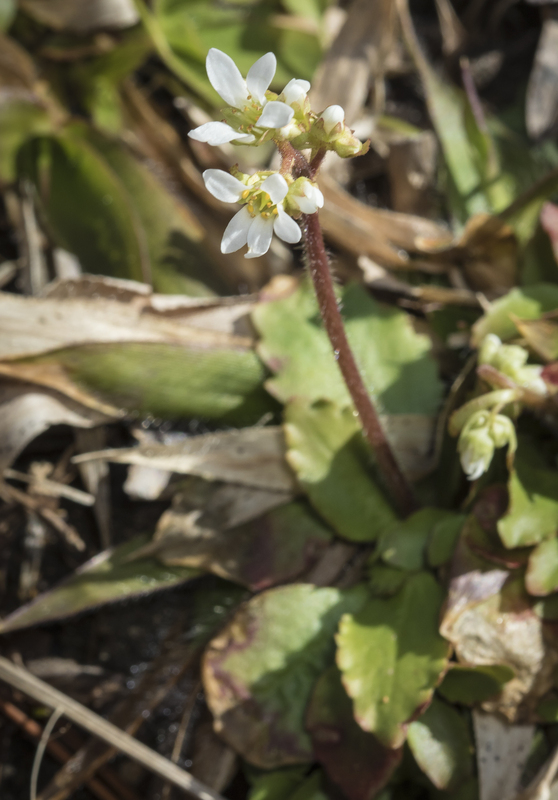 It is not far from my beloved Roads End (yes, I really did live at the end of Roads End, hence the name of this blog) and it, too, is a place of beauty, but without quite as much habitat diversity as the power line corridor at Roads End provided. The woods are older here, comprised mainly of towering Tulip Poplars, White Oaks, and various hickories. One added natural feature is that there is a little water here – some woodland pools and an intermittent wet-weather stream. With that, and the appropriate upland habitat, comes a special group of animals. 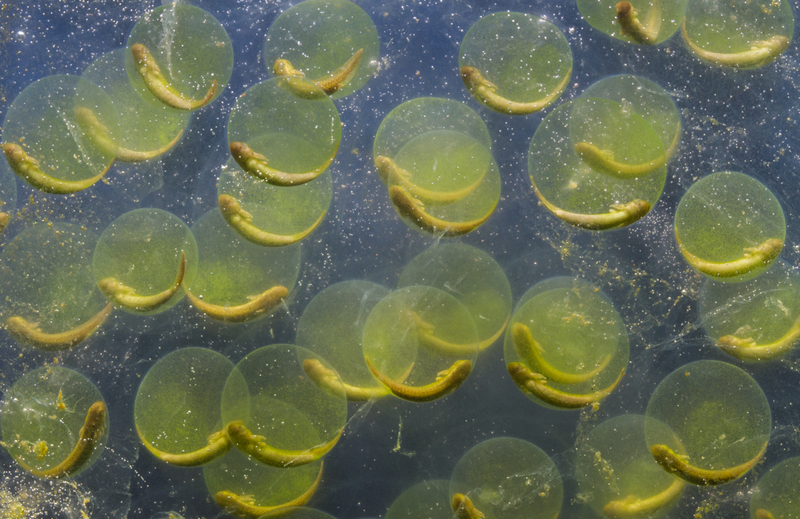 I had seen a few Spotted Salamander egg masses in the pool right before all the cold weather hit and was anxious to see how they would fare after their home was frozen for the past 2+ weeks. 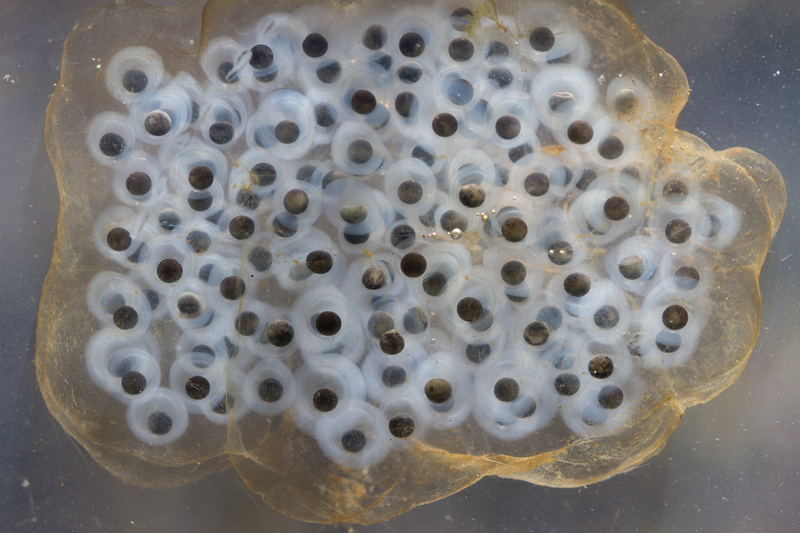 Since the female salamander had attached most of the egg masses to twigs well below the water surface, almost all of the eggs seem to have survived quite well. I lifted one of the twigs to show the egg mass for the photo above. This is a great sign of things to come here in these woods. 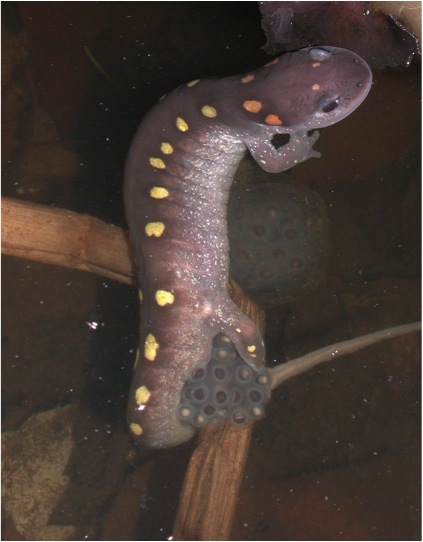 I shared an early sign of spring about a month ago when I posted some images of Spotted Salamander spermatophores (Salamander Candy) in a woodland pool near my home. 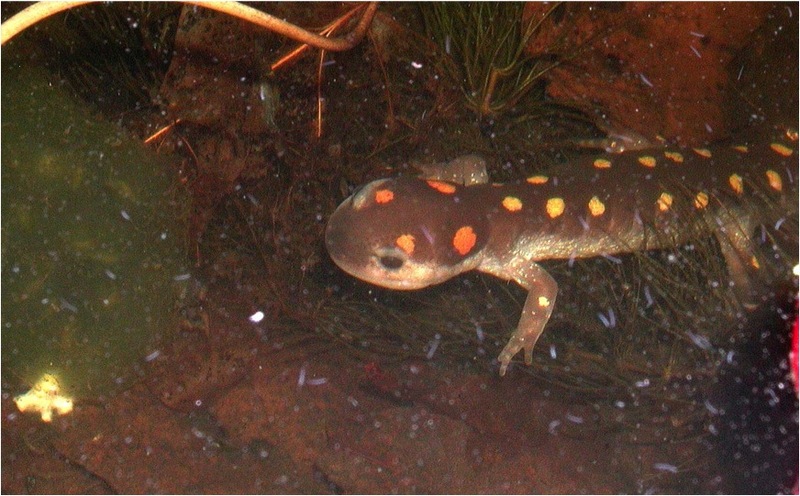 Last week I checked out that pool, and a few others, looking for the next step in the recipe for creating a full-baked Spotted Salamander – the egg masses. 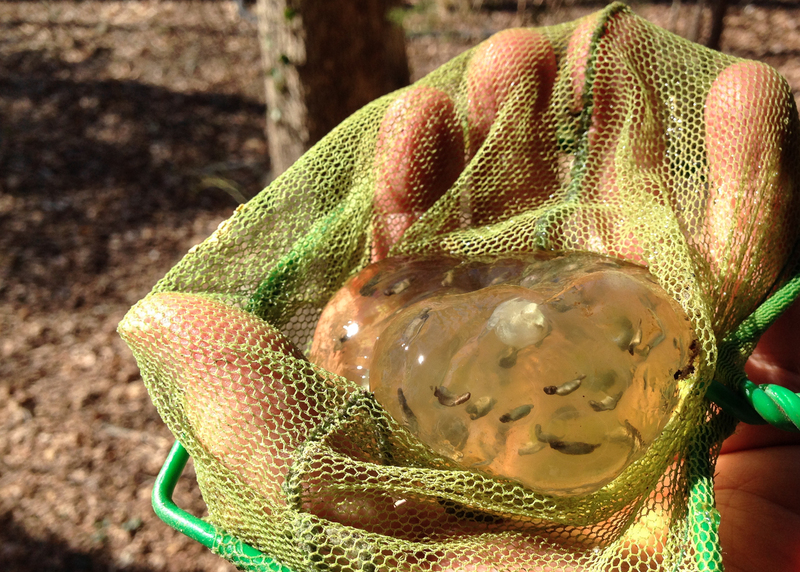 These jelly-like blobs usually contain 50 to 200+ individual eggs. 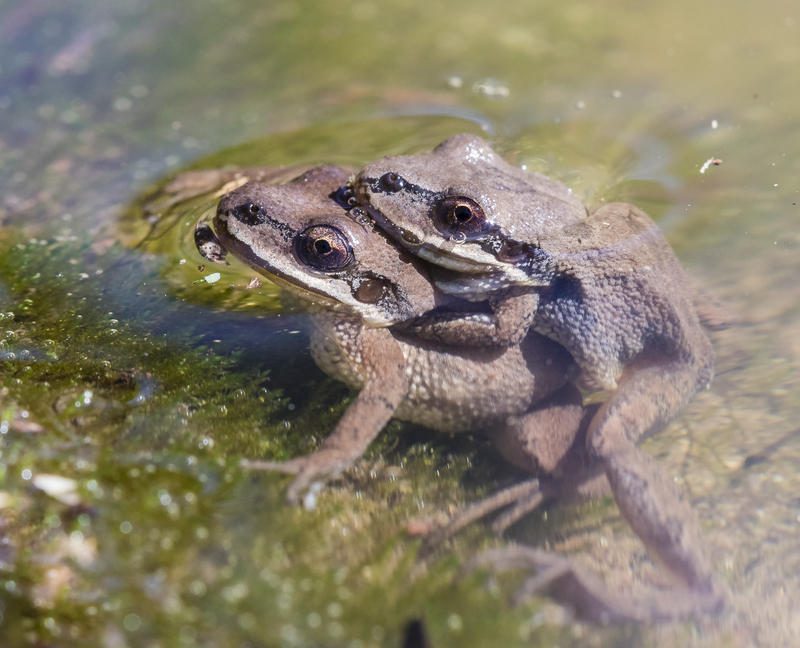 When first deposited, they are about the size of a golf ball. 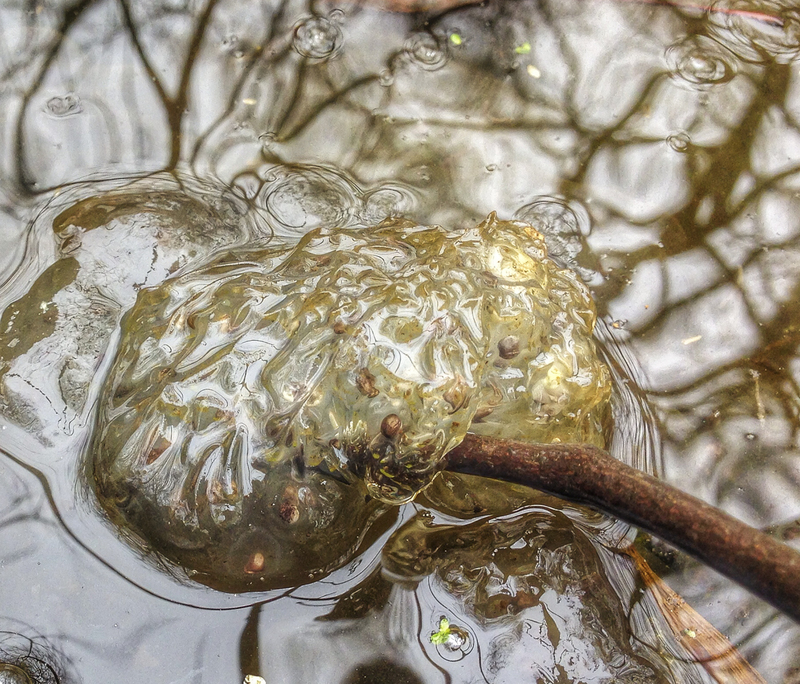 Over the next few days, the gelatinous mass absorbs water and grows much larger, often almost attaining the size of a somewhat elongate softball. 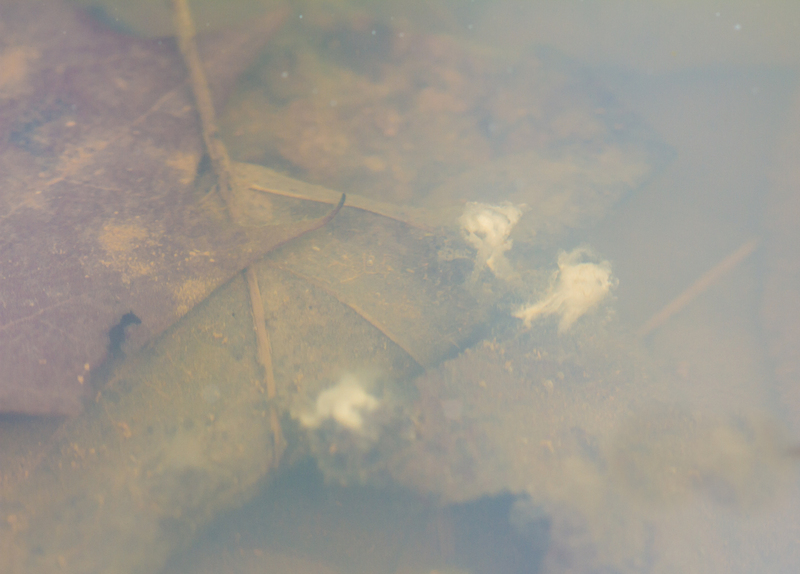 Most of the egg masses I saw in the shady woodland pool were still in the “nub” stage – the developing embryos are not yet recognizable as salamander larvae. 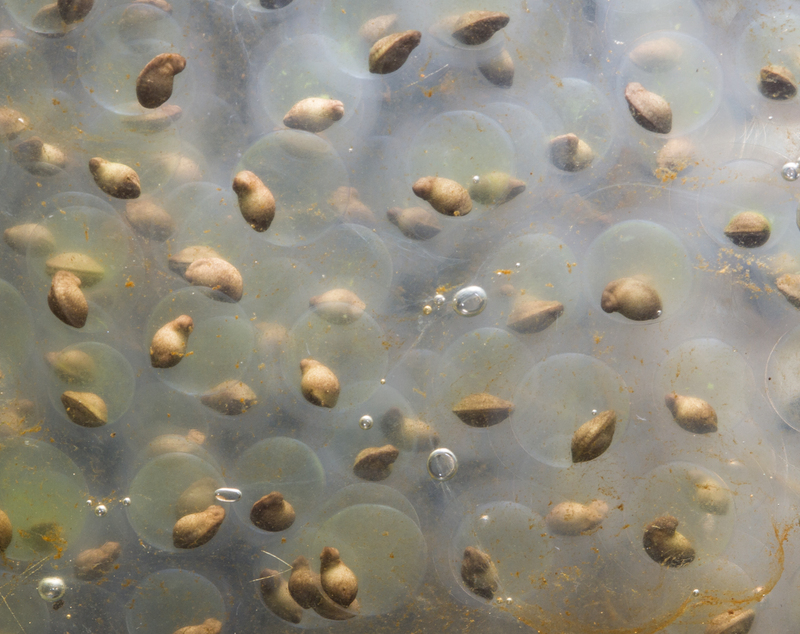 The amount of detail you see depends greatly on the light used to illuminate the egg mass. It will probably take another week or two of warm weather before these hatch. 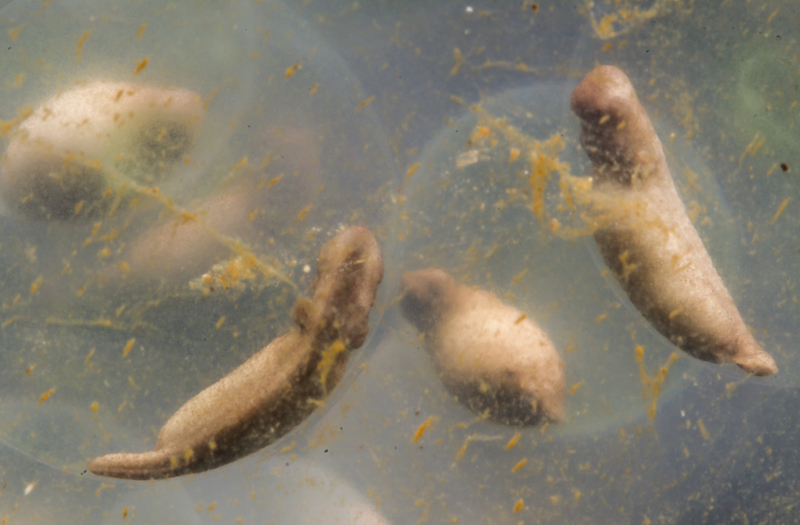 That same day, I traveled to an open roadside site near Jordan Lake where I found salamander eggs in the past during my amphibian workshops for the museum. The site has been altered since I last visited and is smaller now due to some bulldozing nearby. 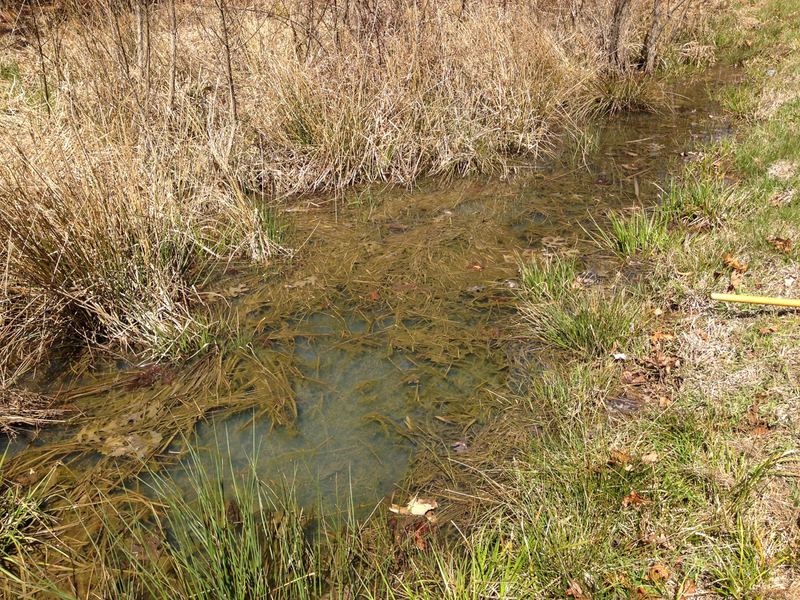 To my delight, there are still salamanders hanging on at this site. These are much further along in their development. 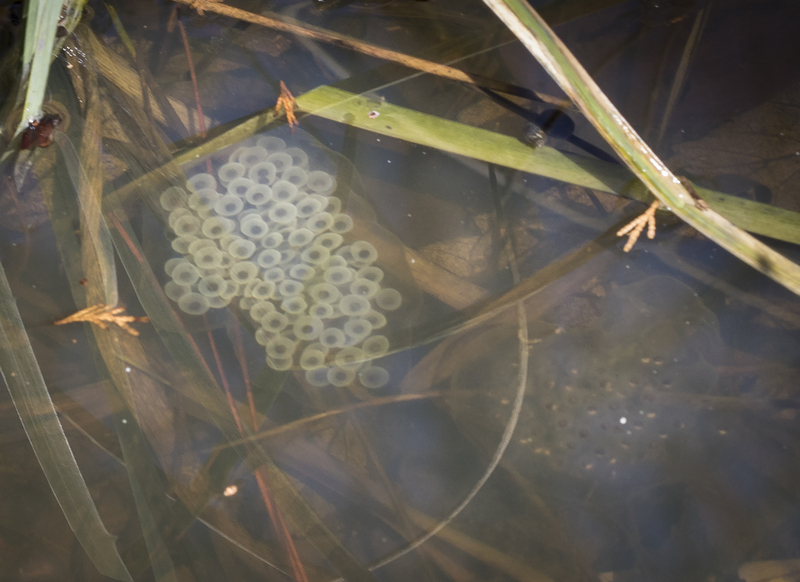 They may have been deposited at an earlier date than those from the other location, but since this site receives full sun most of the day, these eggs probably develop faster than those from the shady woodland pool. 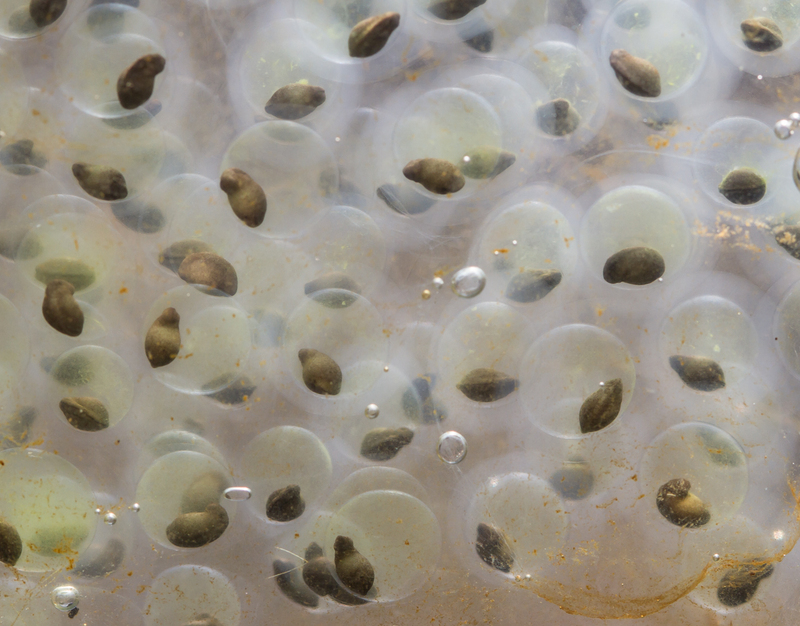 Again, the angle and type of lighting gives a much different look to the art of the egg mass. 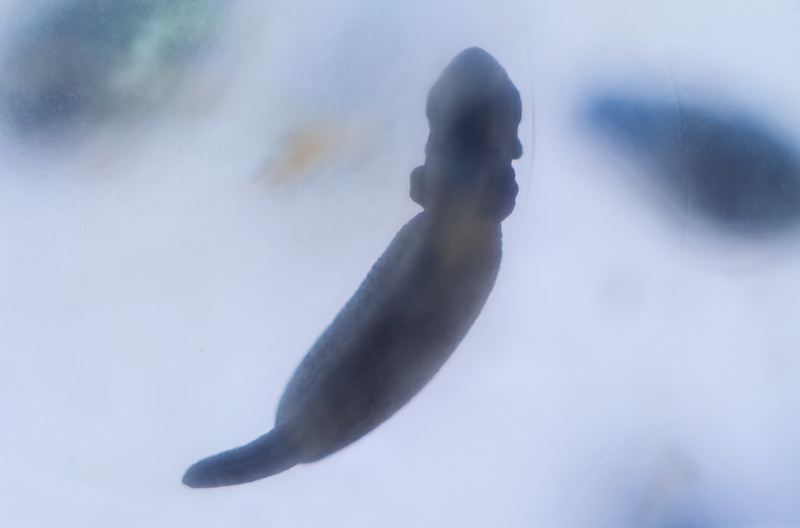 The last stage before hatching. Note the two layers to the egg (all of which is also embedded in a gelatinous matrix with the other eggs). 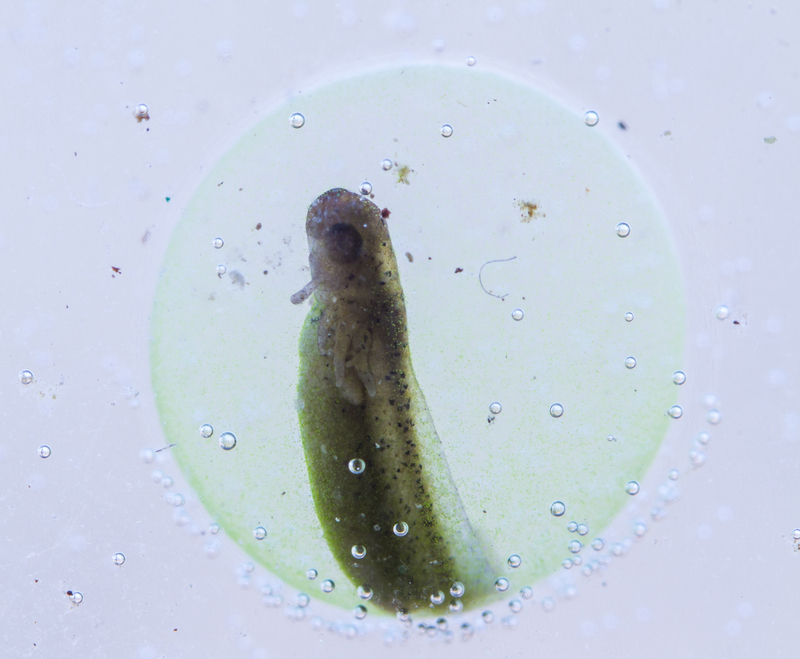 You can also see the symbiotic green algae in the egg layer. 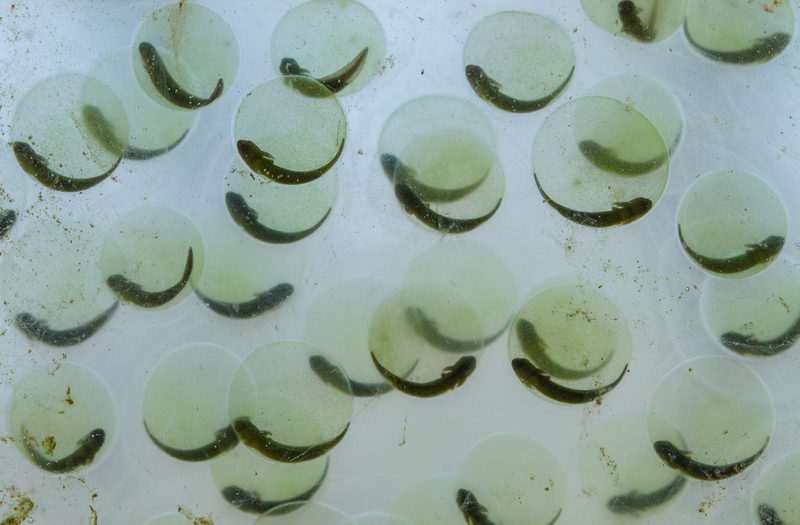 The gelatinous matrix begins to deteriorate right before the larvae start hatching so you get these individual, greenish salamander globes in the water. I think this may be my favorite part of the recipe.